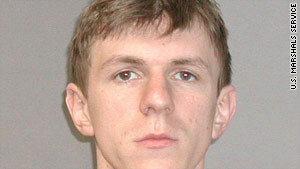 James O'Keefe and three co-defendants were fined and placed on probation. (CNN) -- Conservative videographer James O'Keefe and three co-defendants pleaded guilty Wednesday to entering federal property under false pretenses for a January incident in which they tried to tamper with the phone system in the New Orleans office of Sen. Mary Landrieu. O'Keefe, 25, and co-defendants Joseph Basel, 24, Robert Flanagan, 24, and Stan Dai, 25, were each fined $1,500, placed on probation and ordered to do community service, according to a Department of Justice statement. The four were arrested in January after Basel and Flanagan posed as telephone repair workers to get into Landrieu's office. O'Keefe also was in the office and secretly videotaped the incident, while Dai was outside, according to the Justice Department statement. Landrieu, a Democrat, had voted in favor of the Democratic health care reform bill the previous month. Calling himself an "investigative journalist," O'Keefe claimed he was trying to test the credibility of a claim by Landrieu that her office had been unable to field calls from constituents opposed to her stance on the Senate health care bill because her phone lines had been "jammed for weeks." Basel and Flanagan told a staffer in Landrieu's office that they were telephone repairmen and were granted access to the reception desk's phone system. All four were arrested shortly after leaving the office. O'Keefe is the same conservative activist who dressed as a pimp last summer and visited the offices of ACORN, which bills itself as an advocacy group for low- and middle-income families, to solicit advice on setting up a brothel, among other scenarios, law enforcement officials confirmed. He secretly recorded the visits on videotapes that were posted on the Internet, leading to a media firestorm. ACORN announced in March it was shutting down due to a loss of funding.